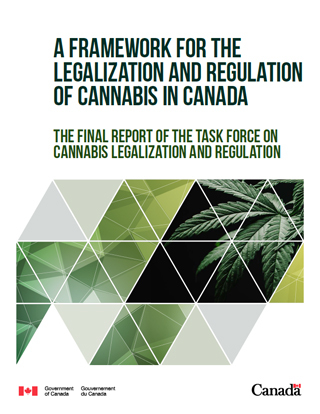 In a comprehensive final report by the Task Force on Cannabis Legalization and Regulation, released to the public on Tues Dec 13, 2016, recommendations covering a broad range of areas of public policy have attempted to nurture the development of a robust industry, while addressing potential problems. Some recommendations appear very favourable to established cannabis advocates, while others are far too restrictive and bound to be struck down in court. Overall, these proposed regulations are a positive step forward and will give the federal government a solid base upon which to frame the actual laws, which are expected to be introduced Parliament in the spring of 2017. With so many opposing forces demanding extreme positions, it was impossible for the task force to please everyone and this document seems to be a genuine attempt to strike a balance between conservative parents and a free society. 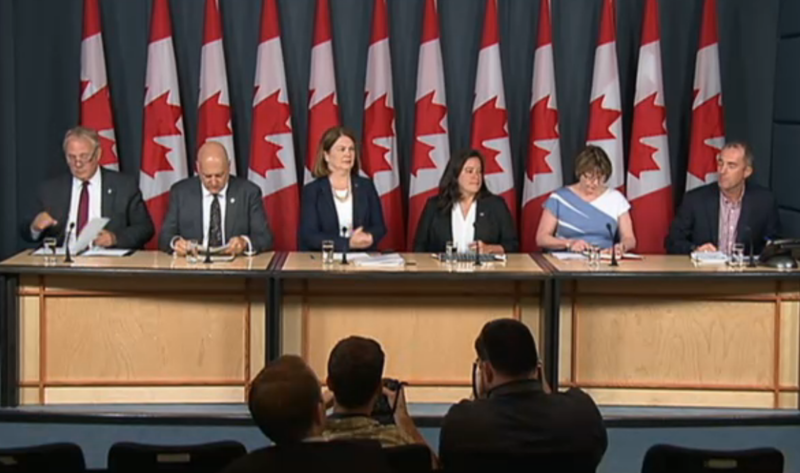 Acknowledging this report as a beginning framework upon which to regulate cannabis, the task force has done a decent job setting the stage, though there are some serious flaws that will no doubt be improved upon over time. For now advocates have their work cut out for them to make sure those improvements happen sooner than later. Clearly, this is a historical moment for our country. In the foreword the task force touches upon the monumental shift that is occurring. Here is my brief synopsis of this report. I give you the Good, the Bad and the Ugly. The Good: Allowing provinces to determine distribution systems and encouraging intensive consultation with municipalities bodes well for established dispensaries in cities that have started to issue licenses to them. Suggesting that the security requirements for become a Licensed Producers need to be reduced so as to allow for smaller craft growers, there even appears to be hope that the current suppliers of dispensaries could also merge into the new legal system. Setting the minimum age at 18 was an unexpected surprise, especially given the pressure the Canadian Medical Association applied to have the limit set at 25. In the second chapter the task force explains their wisdom in this decision. 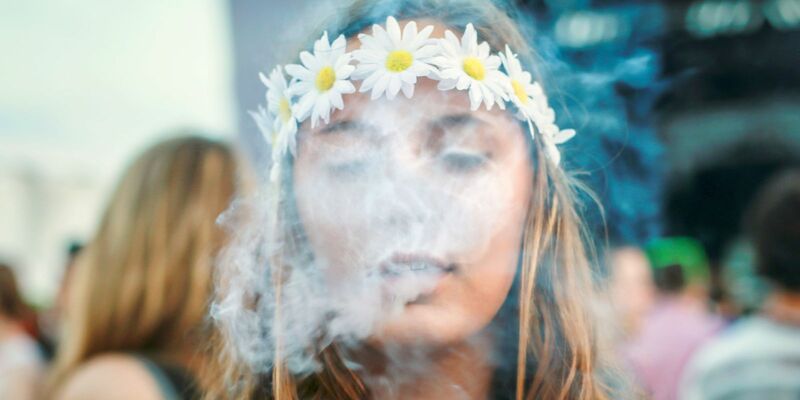 “Research suggests that cannabis use during adolescence may be associated with effects on the development of the brain. Use before a certain age comes with increased risk. Yet current science is not definitive on a safe age for cannabis use, so science alone cannot be relied upon to determine the age of lawful purchase. Recognizing that persons under the age of 25 represent the segment of the population most likely to consume cannabis and to be charged with a cannabis possession offence, and in view of the Government’s intention to move away from a system that criminalizes the use of cannabis, it is important in setting a minimum age that we do not disadvantage this population. There was broad agreement among participants and the Task Force that setting the bar for legal access too high could result in a range of unintended consequences, such as leading those consumers to continue to purchase cannabis on the illicit market. Another pleasant surprise came when the task force refused to place limits on THC content or try to stop edible cannabis products from entering the market, as the city of Vancouver has done in its licensing of dispensaries. With so many fear mongers out there, it seemed unlikely the task force would have such an open position but in chapter 2 they do their best to explain why THC limits and similar measures would have counter-productive impacts. “In weighing the arguments for and against limitations on edibles, the majority of the Task Force concluded that allowing these products offers an opportunity to better address other health risks. 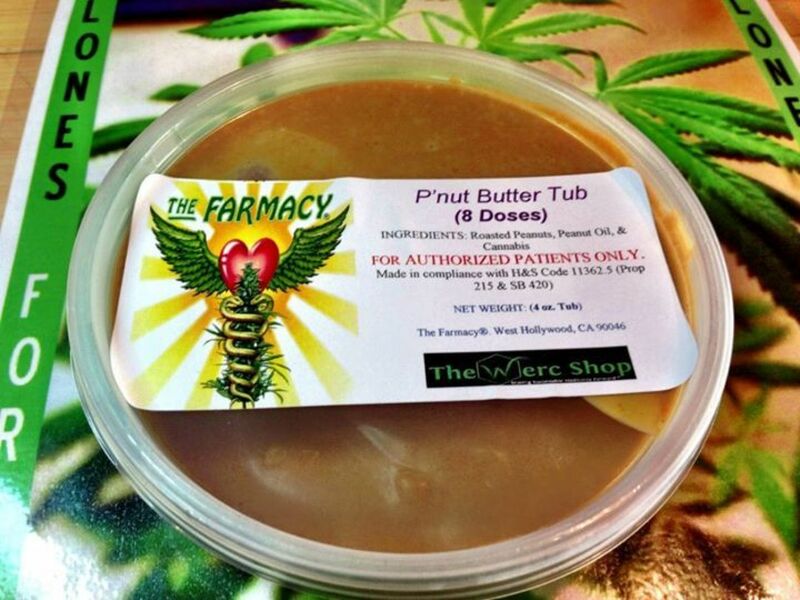 Edible cannabis products offer the possibility of shifting consumers away from smoked cannabis and any associated lung-related harms. This is of benefit not just to the user but also to those around them who would otherwise be subject to second-hand smoke. 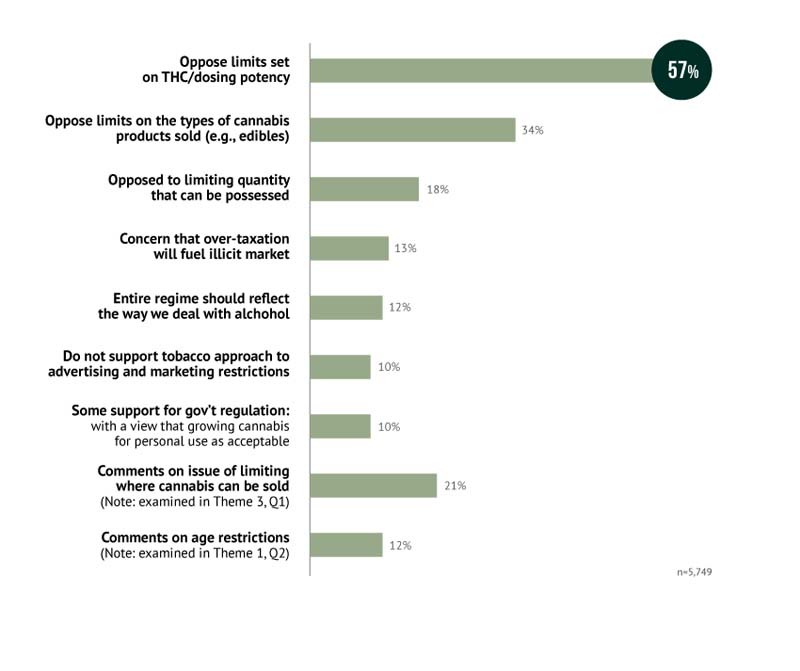 Summary of responses about restrictions on a variety of factors such as potency limits, types of products, amounts allowed, etc..
As for advertising, it seem the proposals are relatively fair, though likely to change over time as the public loses its fear of the herb. Details on permitted advertising are also in chapter 2, and are very similar to how advertising for alcohol and tobacco are managed. Next blog we get to the bad. Thank you for sharing, especially for those of us who have a hard time reading such a thick text. (i get angry just trying to read through the 1st chapter). One big surprise for me was to see the use of the word “Cannabis” instead of “Marijuana” or “Marihuana”. As Mayor Lisa Helps made the change from ‘Marijuana’ to ‘Cannabis’ for the Cannabis Related Business By-Laws, it’s great to see the correct term used. My hopes is that those of the Reefer Madness generation and even admitted that “they don’t even know what marijuana looks like”, will be able to now take a good hard look at it being called by it’s correct name. As for Trudeau’s liberal views on legalizing marijuana and his edict that all Liberal candidates be pro-choice, they aren’t stumbling blocks for Casey. The word “marijuana” is a common term used most often in reference to the dried flowers and leaves of the cannabis plant. It is a slang term that is not scientifically precise. We believe it is more appropriate to use the term cannabis when engaging in a serious discussion of the goals and features of a new regulatory system for legal access. Also, it would be great to include Kirk Tousaw’s comments, or a link to it.